The third hull in the Kando 33.6 metre motor yacht series has been listed for sale by Paul Cave and Mark Seaton at Yacht & Villa. Currently under construction in steel and aluminium by AvA Yachts in Turkey to a design by in-house naval architect Atilla Kucukdiker, delivery is scheduled for October 2020. Accommodation is for ten guests split across five staterooms, including a main deck master suite that spans 27 square metres. Three doubles and one twin room complete the layout of the guest areas. Meanwhile, the crew quarters allow for a staff of up to seven people aboard this yacht for sale. Relaxation options on board Kando include the main deck saloon and the sky lounge, both of which benefit from 48 square metres of floor space and floor-to-ceiling windows. Moving to the upper deck and guests can choose to relax in the built-in spa pool or enjoy the shade provided by the hardtop Bimini. The interior décor is described as modern, creative and functional, with American walnut and wenge woodwork, as well as polished stainless-steel frames surrounding the sliding glass doors. Power will come from a pair of Volvo Penta 650hp diesel engines for a top speed of 14 knots. When trimmed back to her cruising speed of 12 knots, Kando will boast a maximum range of 2,600 nautical miles, drawing on a total fuel capacity of 45,000 litres. 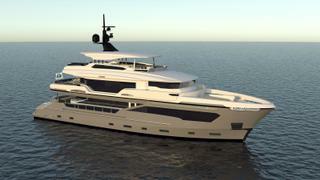 The Kando 110 is asking €7,950,000.